If you’ve joined our movement, tell the world! Simply cut and paste the following press release language and adapt it for your organization’s own use. City, Date – Today, [your organization] announced its support for the Campaign for Disability Employment (CDE), a national public education movement that promotes the hiring, retention and advancement of people with disabilities in America’s workforce. The CDE’s multi-faceted campaign features a series of award-winning public service announcements (PSAs) and coordinating media assets, all designed to promote positive employment outcomes for people with disabilities. 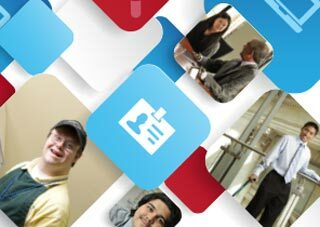 Its products and positive messages are encouraging businesses and others to recognize the value that individuals with disabilities bring to the workplace, as well as the dividend to be realized by fully including them at work. In support of the Campaign, [your organization] will promote the advocacy website, WhatCanYouDoCampaign.org, which features a suite of grassroots tools and tangible ideas for supporting the Campaign’s goals, as well as four video PSAs that challenge assumptions about people with disabilities and employment. The award-winning “I Can” PSA features real people with disabilities expressing what they “can do” on the job when given the opportunity. Its sequel PSA, “Because,” promotes the message that youth with disabilities should grow up expecting to work and succeed. “Who I Am” reminds us to see one another for who we are and what we can contribute, while “Working Works” explores the many reasons people work, including after injury or illness. Funded by the U.S. Department of Labor’s Office of Disability Employment Policy, the Campaign for Disability Employment (CDE) promotes positive employment outcomes for people with disabilities by encouraging employers, and others, to recognize the value and talent people with disabilities bring to America’s workplaces. As the force behind the national public outreach initiative, “What can YOU do?,” the CDE has distributed four powerful public service announcements, “I Can,” “Because,” “Who I Am” and “Working Works,” which aim to raise awareness and change attitudes about disability and employment. Launched in 2009, the Campaign is a collaborative effort among ODEP and the following disability and business organizations: the American Association of People with Disabilities (AAPD); Disability:IN; the Employer Assistance and Resource Network on Disability Inclusion (EARN); the Job Accommodation Network (JAN); the National Business and Disability Council (NBDC); the National LGBT Chamber of Commerce (NGLCC); the National Organization on Disability (NOD); the Society for Human Resource Management (SHRM); and Special Olympics (SO). Numerous other supporters are actively promoting the CDE message. To learn more, visit WhatCanYouDoCampaign.org.